Ghostly Thirteen was inspired by the Thursday Thirteen meme. You list thirteen paranormal-related things, for example your top 13 posts (if you have a paranormal blog), mythical creatures, gods, haunted houses, etc... All is welcomed to participate either in the comments section or your own blog. Theme is up to you as long as its paranormal related. Do you listen to paranormal themed podcasts? If so, which ones? There is nothing worse than a ghost – unless it is a ghost inhabiting some of your beloved family heirlooms. In the new Syfy reality series Haunted Collector a family of paranormal investigators hunt down haunted items bewitching their frightened owners. Follow paranormal researcher John Zaffis each week as he and his family investigate some of these terrorizing objects in homes across the country. In the premiere, the team digs deep as they literally go hunting after a haunted item under a house with a metal detector. Watch the clip and tune in to the premiere on Wednesday, June 1 at 9/8c only on Syfy to see what they unearth! There are two haunted tunnels in Chillicothe, Ohio, one being the Schrader Road Tunnel. It is believed a woman and her child died inside this tunnel. The manner of death depends on who you ask. A common version has the woman putting her infant on the railroad tracks just as a train approached. Another has her slitting the baby's throat and then hung herself. The second story may bleed in to the alleged death of a second woman at the tunnel. This woman was murdered either by hanging or killed first and then hung from a tree branch at the north end. Do you think there may be a zombie outbreak in our future? Several people email me about sharing links to their websites or blog posts or I come across articles and always seem to bookmark them. Then, forget about them. They sit in my favorites folder forever until I get the urge to purge which doesn't happen often. So, a Facebook page seemed like a logical solution. Ghost Stories the Blog is name chosen mainly because the term "Ghost Stories" is rather popular. It'll feature links to articles, websites, blog announcements and blog posts. Feel free to make comments or add your photos and videos. Some establishments embrace a haunted status whether there be any validity to the claims or not. The Finney County Preservation Society who took ownership of the Garden City's Windsor Hotel is not certain it has a paranormal presence despite what others say. However, there is consideration of the idea if only to save it from the same fate others before it have fallen prey to. What is the Singapore Stone? I have reviewed books, TV shows, and the occasional movie, but not so much music. There seems to be a bit of a shortage on paranormal related music. Not horror. Paranormal. I was asked to give an Indie paranormal modern folk singer/songwriter a chance. Honestly, I haven't heard a lot of folk music that has grabbed my attention in the past and I know there has been some great singers who have bulldozed the genre in to the population's hearts. I have an eclectic taste in music and was willing to give Jonah Knight a try. There are several Hudson Houses located in the United States. However, little is known about the one located in Ashland, Alabama. It is believed the little old house situated in the middle of nowhere may have been built in the early 1900s, but records have not been found to prove this. There is a story of the house being a brothel at one point in its history. Wayward politicians drive out to have a little x-rated fun. There is no evidence to support this. So, for now, I leave it to be a work of fiction. Could it have been the home of a singular family line? Generations called it home until it became vacant and boarded up? Possibly. St. Francisville Experiment was suppose to be an actual documentary about a night in an actual haunted house. It starts off with the producer telling the audience that everything presented in the movie was true. When you actually see the movie, you learn it is anything but that. It is allegedly a film marketed as a real version of the Blair Witch Project. In order to do this, they needed a ghost story and a location to film. St. Francisville, Louisiana is known for its hauntings, making it a perfect location for this movie. The actual ghost story that inspired it was that of the Madame Delphine LaLaurie. She was married to a doctor named Louis LaLaurie and they lived in a beautiful mansion in the French Quarter. According to the story, she was particularly cruel to the slaves they owned. What if you lost a child tragically. What would you do to have one final moment with them? Hammer Films takes on this question in one of their latest movies Wake Wood. Vet Patrick and Pharmacist Louise Daly loss their only child to that of a crazed dog attack. 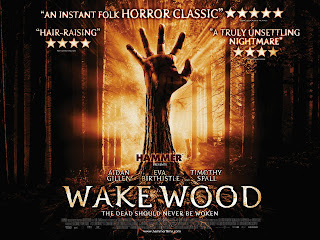 They relocate to the remote Irish village of Wake Wood after learning of their unusual tradition. Inhabitants participate in a pagan ritual which brings back a person one year after their death for three days. This ritual allows a deceased to say their final farewells to their loved ones before making their final journey to the spirit world. While many celebrated the announcement of Osama bin Laden's death, some are waiting for proof. Why? Because it was reported in December 2001 that Bin Laden had died either in the Battle of Tora Bora or by a fatal ailment. Do you believe Navy SEALs located and killed Osama bin Laden in a weekend raid on his compound in Pakistan or died in 2001?